Free Speech on Campus (6): What’s at Stake? Many factors have contributed to this trend especially since the ’90s, but a big one is the collapse of traditional network news and rise of “curated” information gathering on cable and online. It’s been much easier in recent decades for people to listen to those with whom they already agree, and to respond to opposing viewpoints with mockery and charges of bad will. Colleges and universities should be a corrective to this trend instead of following it. The stakes are high, conclude the authors, as we help today’s generation of students understand why free expression matters, on college campuses and in the world. They can hardly be expected to fight for free speech values if they don’t understand their history, practicality, and ethical premises. I found this book to be a helpful presentation of the issue and highly recommend it. 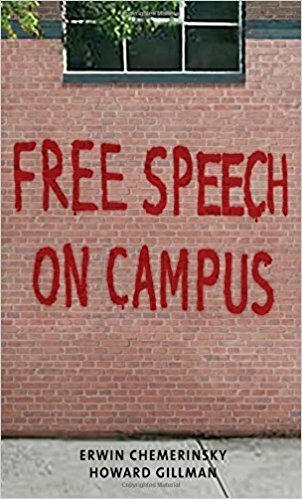 This is the book on campus free speech I’ve been waiting for. The authors are constitutional scholars who teach a course in free speech to undergraduates, and their position is that campuses must provide supportive learning environments for an increasingly diverse student body while never restricting the expression of ideas in the process. I’ll summarize the six chapters below, and then devote a separate blogpost for each chapter over the next week. Chapter 1: The New Censorship. The authors’ central thesis is that all ideas and views should be able to be expressed on college campuses, no matter how offensive or how uncomfortable they make people feel. But there are steps that campuses can and should take to create inclusive communities where all students feel protected, without catering to “trigger warnings” and “microaggressions”. Chapter 2: Why Free Speech is Important. A brief history of how the idea evolved. Today’s generation often has little understanding why it is a crucial right that needs to be protected. Chapter 3: Free Speech at Colleges and Universities. Free speech is important in society as a whole, but even more so on college campuses. The authors’ position is absolute: campuses never can censor or punish the expression of ideas, no matter how offensive, because otherwise they cannot perform their function of promoting inquiry, discovery, and the dissemination of new knowledge. Although the First Amendment applies only to public universities (and rightly so, as a matter of law), all colleges and universities nevertheless should commit themselves to these values. Chapter 4: Hate Speech. The authors look at the real harm caused by hate speech on campus, review the First Amendment in this area as well as the history of hate speech codes, and explain that although well intentioned, campus bans on hate speech are not desirable. Chapter 5: What Campuses Can and Can’t Do. This chapter offers ideas on how to create inclusive learning environments without undermining freedom of speech and expression. Most notably — and this is often overlooked — campus leaders can engage in more speech themselves, by proclaiming the type of community they seek and condemning speech (without censoring it or punishing the speakers) that is inconsistent with those goals. Chapter 6: What’s at Stake? The final chapter looks to the future. If campus leaders allow calls for “safe spaces” to suppress the expression of any idea, little will remain of free speech or academic inquiry. But if campus leaders do not find ways to create a conducive learning environment for everyone (without suppressing ideas), they will discover that they have provided free speech to some but not for all.